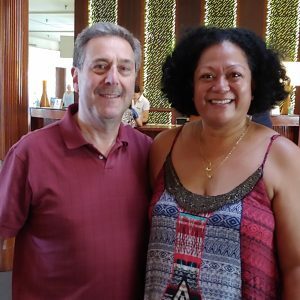 Bulent Bicer, Project Manager of Research at Arizona State University’s Ira A. Fulton Schools of Engineering, recently represented ASU at the annual Top Executive Conference (TOPEX) in Fiji. TOPEX is hosted by the Fiji Commerce and Employers Federation, the country’s chief employer organization. This year’s theme was “Change and Transition: Readiness and Resistance,” and about 200 executives were in attendance. Bicer presented on behalf of Amanda Ellis, who develops relationships throughout Hawaii and Asia Pacific as the Director of Strategic Partnerships for ASU’s Julie Ann Wrigley Global Institute of Sustainability. Bicer and Ellis worked together on the presentation titled “Renewable Energy and Sustainable Development Goals,” which provided an overview of renewable energy as part of human development, and, more specifically, the importance of renewable energy in Fiji and other island nations. During the presentation, Bicer spoke about ASU’s past and ongoing activities in Fiji and the Pacific Islands, such as SolarSPELL and Vocational Training and Education for Clean Energy (VOCTEC). SolarSPELL is a Solar Powered Educational Learning Library: a ruggedized, portable, solar-powered digital library that uses an offline WiFi hotspot and is designed to simulate an online experience. Making use of open educational resources and ever-smaller and more efficient technology, SolarSPELL provides an all-in-one, self-powered plug-and-play kit, ready to be deployed with minimal training or maintenance required for start-up and continued operation. So far, 200 SolarSPELLs have been distributed across the Pacific Islands and East Africa, and the goal is to deploy an additional 120 by the end of the year. Four schools in Fiji will receive their first SolarSPELLs this month. VOCTEC is a partnership between ASU, USAID and the International Renewable Energy Agency to improve the sustainability of renewable energy infrastructure and investments in developing countries. VOCTEC provides local technicians with the knowledge, training and capacity to install, operate and maintain these systems and the ability to transfer those skills to future generations. The project is building human capacity for clean energy systems, developing lab and training infrastructure, and preparing clean energy workers for certification for international standards, with a special emphasis on empowering and improving opportunities for women. VOCTEC works heavily in the Pacific Islands, including Fiji. The TOPEX conference allowed ASU to provide delegates with examples of successful educational and development initiatives, and to discuss the importance and the outlook of sustainable energy in Fiji and around the world. Top photo: Bulent Bicer with event organizer Suka Salusalu.